This beautiful anglewing was once common in Massachusetts; it is rare today, but may be increasing. Unlike the Eastern Comma or the Question Mark, Gray Comma has no southeastern seaboard range (see maps in Cech 2005; Opler and Krizek 1984). It is one of the northerly commas, and despite recent increases here it may be vulnerable to range contraction as climate warms. As with so many of our species, Thaddeus W. Harris at Harvard was the first to report it in Massachusetts. He was quite familiar with Gray Comma, had raised it several times, and had four specimens which were collected in 1828, 1830, and 1854; the first two probably in the vicinity of Milton, Massachusetts, where he lived (Harris 1841: 221-2; Harris Index; Calhoun 2009). Scudder wrote that Gray Comma was “more generally distributed and universally common than any other species of Polygonia...” in New England. In fact, it was somewhat more abundant in the southern than the northern parts of the region (1889: 369). Scudder does not list specific locations for Gray Comma, probably because they were too numerous. But collector F. H. Sprague caught a total of nine specimens in Wollaston (now in Quincy) in April 1878, plus one in the Connecticut River valley in Belchertown in July (Sprague 1879). He caught two more in Wollaston in 1879, two more in Belchertown in 1882 and 1897, and one in Gloucester in 1897 (specimens in MCZ). C. Bullard caught one in Arlington July 3, 1897, and C. J. Paine had one in Ashburnham in 1922 (specimens in MCZ). L.W. Swett had one in Malden in 1908 or 1909, and H. L. Clark caught one in Bristol, R.I. in 1912 (specimens at Boston University). By 1934, Farquhar adds Dover, Malden, Stoneham, Salem, and Lynn as locations at which specimens had been taken; note that several of these are on the northeast coast in Essex County. In 1939, F. M. Jones reported Gray Comma from Martha's Vineyard: he took specimens at baited trees in West Chop on September 11 and on flowers in Edgartown on September 14, 1939, and noted that the host plant Ribes was present on the Vineyard (Jones and Kimball 1943: 31). Two of his specimens reside today in the Yale Peabody Museum. A look at Gray Comma’s host plant provides the key to this butterfly's rise and decline in southern New England. Gray Comma probably expanded its range southward into Massachusetts, Rhode Island and Connecticut along with the expansion of colonial agriculture (Table 1). The specific host crop was garden currants. Cultivation of European red and black currants (Ribes sativum and Ribes nigrum) along with native Ribes strains was widespread in southern New England through the late 1800s. Gray Comma’s native host plants are currants and gooseberries (Ribes rotundifolia and others), and according to 19th century sources it adopted the introduced strains of currants as well, becoming one of the many butterfly species to have added non-native plants to their diet (Table 3). Gray Comma became known as a pest of cultivated currants in Illinois and Ontario, but was apparently not abundant enough to pose an agricultural problem in New England (Scudder 1889: 369). Then, around 1910, an American nurseryman imported thousands of white pine seedlings which were infected with European white pine blister rust, for which Ribes plant species are the alternate hosts. Our native white pine, Pinus strobus was not resistant, and this commercially important species was threatened. To protect the lumber industry, importing or cultivating all currants and gooseberries was banned in most New England states. In the 1920’s and 1930s both native and cultivated Ribes plants were ripped up all across New England and the Great Lakes areas, as well as further west. By 1966 the ban was lifted in many areas, but is still in place in Massachusetts (Cullina 2002: 221-2). The host plants for Gray Comma therefore declined dramatically, as did the butterfly. Note to Collectors: Gray Comma is a rare species in Massachusetts today, and collectors are asked to refrain from taking specimens for any purpose. Gray Comma’s characteristic habitat is openings in rich northern deciduous or mixed conifer forests. It is there that its main host plants, native currants and wild gooseberries, are usually found as part of the shrub understory. Ribes rotundifolia, Appalachian gooseberry, is the usual listed host (Scott 1986), but Gray Comma may also use Ribes americanum (wild black currant) and/or R. hirtellum (swamp or downy gooseberry), both of which are more common in Massachusetts than is rotundifolia (Sorrie and Somers 1999; Magee and Ahles 1999). Other species of currants and gooseberries were introduced as garden plants, and have spread into the wild and become naturalised; these may be being used as well. They include R. nigrum, (garden black currant) R. rubrum (garden red currant), and R. uva-crispa (garden gooseberry). 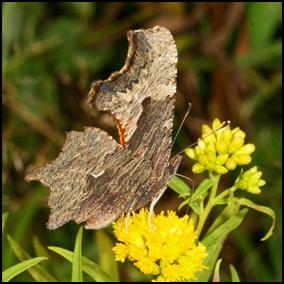 Gray Comma is among the "Switchers;" butterfly species which have been known to adopt non-native host plants (Table 3). Other possible host plants include Rhododendron nudiflorum (pinxter flower), occasionally birch, and dubiously elm (Scott, 1986). Dirt logging roads and camp sites in deciduous woods are good places to look for Gray Commas. They are drawn to puddles, moist spots, sap flows, and decaying matter. Scudder wrote that they were “often seen sipping the sweet juice of drying or decaying fruit” and were “fond of pitching on apple trees...opening their wings to catch the full rays of the sun” (Scudder 1889: 371; see also Shapiro 1974, Cech 2005). This species went from “common” in the late nineteenth century to “rare” in 2000-2007. There are virtually no Massachusetts reports or specimens between 1930 and 1986, except for one seen in Concord July 9, 1978 by B. Cassie ( MAS Atlas) and two caught at bait in Hopkinton April 13, 1981, by T. Franks (LSSS 1981). The 1986-90 MAS Atlas termed Gray Comma “Rare to Uncommon.” Four occurrences were found by Atlas workers, all in Berkshire County. They are 7/6/1987 Great Barrington, A. Rennie, photographed; 7/28/1988 Hinsdale, E. Neumuth, photographed; 7/27/1988 Washington, E. Neumuth, photographed; and 7/30/1989 Windsor E. Neumuth. MBC sight records 2000-2007 ranked Gray Comma as “Rare” (Table 5), but, in a curious reversal of fortune, this species began to be seen again in 2009 and became well-reported and photographed in 2011 through 2013. It may now be trending upward in the state. Chart 51 includes all sightings 1992-2013. Looking at this chart and 2010-2013 data, it appears that Gray Comma’s numbers are increasing in the state. But to a certain extent the western part of the state is now much better covered by knowledgeable butterfly enthusiasts than it was in the 1990’s. The story of the few 1992-2010 sightings is short. One Gray Comma was seen on the South Berkshire NABA Count (primarily in the town of Sheffield) 7/12/2003. 2004 may have been an outbreak year, since a total of four were seen: one on the Northern Berkshire NABA Count 7/11/2004; one in Cummington 7/17/2004 by B. Spencer (photos at www.massbutterflies.org and www.pbase.com/barbaraspencer/anglewings ) ; one 7/18/2004 in Hinsdale (C. Berks. NABA) by T. Gagnon; and one in Orange 7/26/2004 by R. and S. Cloutier (photo at www.massbutterflies.org) . In 2009, one was seen in Williamstown 7/15/2009 by B. Zaremba, and in 2010 one Gray Comma was again seen, Williamstown 8-28-2010, B. Zaremba (photo above). 2011 through 2013 turned out to be the best years in almost a century for Gray Comma in the state. In 2011 seven different individuals were reported, in 2012 at least ten individuals, and in 2013 at least eleven. It is unclear whether these three years represent a mini-irruption or a long-term expansion, but they do represent more than just increased search effort. In 2011 Gray Comma was seen on all three of the Berkshire NABA Counts: one on July 8, 2011 in Egremont on the South Berkshire NABA Count, T. Gagnon, B. Callahan and J. Johnson; one on July 9, 2011 in New Ashford on the North Berkshire Count, J. Rose, photo at http://bugguide.net/node/view/730415 ; and two on July 16, 2011 on the Central Berkshire Count, in Hinsdale and Lenox, by T. Gagnon and B. Higgins (Higgins photos are in Massachusetts Butterflies 37, Fall 2011). Three other individuals, representing the fall brood, were seen in September: West Whately 9/9, Windsor 9/13, and Mount Greylock 9/26/2011, all by T. Gagnon together with other observers. In 2012, the spring flight was reported for the first time since 1981 by T. Gagnon on 4/16/2012 at Windsor. Summer sightings came from Williamsburg Graves Farm 6/29, B. Benner, photographed, as well as the Windsor location, various observers, photos available at http://www.flickr.com/photos/fsmodel/7558424898/in/photostream , and at http://www.flickr.com/photos/fsmodel/8254039870/in/set-72157627816645921/ . A high of 4 individuals were seen at this productive spot in Windsor on 7/19/12. The species was again seen in Sheffield near Bartholomew's Cobble TTOR in July, and a late sighting date was set on 10/18/2012 in the Berkshires. In 2013, the spring flight was again observed in Windsor on 4/24/2013, with 4 individuals seen by T. Gagnon and B. Spencer (photographs). One to two were seen at the same site on 6/1/2013, (Model, deGraaf and Dysart photos available). Two were again seen on the Southern Berkshire NABA Count 7/13/2013, and and fall flight in Windsor was photographed on 9/20/2013 by F. Model http://www.flickr.com/photos/fsmodel/9846250103/ The latest report was one seen 10/11/2013 in Williamsburg by T. Gagnon. Today Gray Comma is being seen only in the western and north-central parts of the state (Map 51), whereas in the nineteenth century it was statewide, and especially along the northeast coast. Gray Comma has been reported from eleven towns through 2013: Cummington, Egremont, Hinsdale, Lenox, New Ashford (Mt. Greylock), Orange, Sheffield, Whately, Williamsburg, Williamstown, and Windsor. Prior to the 1980-86 MAS Atlas, there were two reports from the east-central part of the state, Hopkinton and Concord (see above). But during the Atlas period, Gray Comma was found only in Berkshire County. There are apparently no Cape Cod records of Gray Comma, either historical or contemporary. Nor are there any records for Nantucket. The historical records for Martha's Vineyard in the late 1930's are noted above. Until 2009 all MBC sightings had been in July, mainly because this is when the Berkshire NABA Counts are held. (All four Atlas reports were also in July.) The sightings on the MBC flight chart http://www.naba.org/chapters/nabambc/flight-dates-chart.asp are from 1993-2007, and are all from July. However, since then the known flight period here has been significantly extended on both ends. Spring flight: In 2012 the early spring flight was observed for the first time since 1981 with the 4/16/2012 report from Windsor by T. Gagnon. This was re-confirmed in 2013 by the sighting of 4 on 4/24/2013 by T. Gagnon and B. Spencer (photographs). Fall flight: The 8/28/2010 report from Williamstown by B. Zaremba (see photo above) was the first times the fall brood had been observed in the state since Scudder's time. In 2011 there were three sightings in September (Whately, Windsor and Mt. Greylock), and in 2012 and 2013 there were single October reports. The latest sighting in MBC records is now 10/18/2012, "Berkshire County", T. Gagnon; the next latest is 10/11/2013, Williamsburg, T. Gagnon; followed by 9/26/2011, Mount Greylock, T. Gagnon and B. Callahan. The life history of the Gray Comma is interesting. Like the Eastern Comma, Gray Comma is bivoltine throughout its range. The second generation over-winters as adults, to fly the following spring, often quite early; there are therefore three flight periods. The very earliest reports are in March, April and May. As Scudder put it, Gray Comma is “one of the first to feel the approach of spring, reappearing on sunny days at the end or even by the middle of March. Toward the close of April and early in May it flies in considerable numbers and continues upon the wing until early in June, occasionally to the middle. The eggs are laid apparently about the middle of May...(1889: 370).” In the 1870’s, Sprague collected many specimens in Wollaston in April and May; some of these are now in the Harvard MCZ. Thoreau saw his Gray Comma in April. Contemporary observers have generally not seen this early spring flight; 2012 and 2013 have provided the first recent examples. The second or summer generation appears “in the first days of July, sometimes as soon as the 24th of June; they are therefore seldom abundant before the second week in July and continue to be seen until about the 10th of August...(1889: 370)”. These dates are from Scudder, and he clearly states that they are given “for the vicinity of Boston,” where he was most familiar with the species. It is this July flight which most observers see today in Massachusetts. There are a few historical September Massachusetts specimens in both the Harvard MCZ and the Yale Peabody Museum, but there were no contemporary reports of the fall brood until the August 28, 2010 report previously noted. With the 2011-2013 sightings in September and October, we are now seeing the expected flight pattern, which is similar to that of the Eastern Comma, often seen flying in October, November, and December. 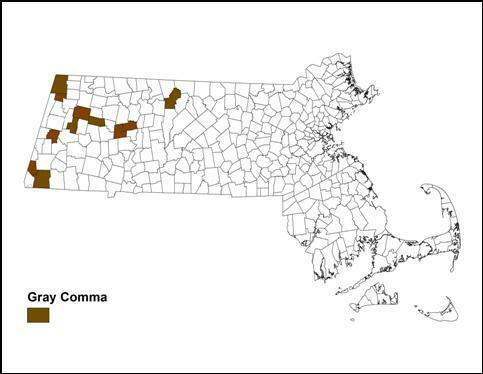 Gray Comma is at the southern limit of its current range in Massachusetts. It is more common and secure in Vermont, New York and New Hampshire (S4, NatureServe 2011). Its thin presence in Massachusetts may be stable and ongoing at some breeding locations in the Berkshires, with populations increasing or decreasing in various years from unknown local causes, or the numbers and range may be periodically expanded by immigrants arriving from further north. The data so far are inconclusive, but reports for two or three years from the same locations in Windsor, Hinsdale and Williamstown argue for in-state breeding. Gray Comma is listed here as a Species of Conservation Concern. If it does reproduce in-state, it should be reviewed for possible addition to the state’s list of endangered or threatened species. More information is needed about what locations are being used for larval growth and winter hibernation, and about the likely extent of breeding habitat in the state. One might expect that such a northern-based species would be at risk of decline here as global climate warming proceeds, but in the last few years we have apparently seen the reverse. The data are still too scanty to permit any guess at abundance trends, but climate change must be considered a risk factor. Species whose status is likely to change with climate warming are listed in Table 6.